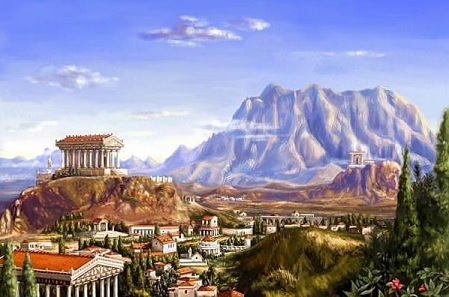 Mount Olympus - The highest mountain in Greece was home to the gods of the ancient Greeks. It rises to a height of about 9580 ft. (2920m) and sits in the Olympus Range in the northern part of the peninsula. The Twelve Olympians made it their home after they overthrew their predecessors, the Titans, in a ten year struggle. After the war, the world was divided into three regions, each ruled by the three sons of the Titan Cronus. The oldest son, Hades, reigned in the underworld; the middle son, Poseidon, ruled the seas; and the youngest son, Zeus, ruled the earth and sky from Olympus.